This tutorial describes features and behaviors that define and influence the performance of Test Generator's Enrollment feature. It does not cover every possible combination of settings that test authors might try--we encourage any feedback and suggestions that might assist other customers. The complete Enrollment Tutorial can be download here. If you are unable to access the tutorial, please contact us and we will be happy to email it to you. If you have not already done so, we recommend scheduling an online demo. Customers possessing an active support subscription can schedule an online demo. Please note, some of the screens in this tutorial are TG version 2.4.20 screens. If you have an active support subscription and would like to update to TG2.4.20, please contact us. 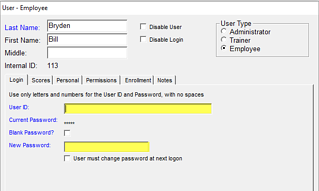 In order for an individual to take a test, they must have a user profile in TG’s database. The user profile includes a User ID and a Password. T.admins can create User profiles manually, or by importing them into TG’s database from a TG-friendly .csv or .xls file or by synching user profiles into TG’s database using our AD/LDAP plug-in. Download the complete Enrollment Tutorial. Automating the enrollment process and saving you time. We've assembled some sample forms for your review. Contact us to schedule a free, online consultation session. The new Users module organizes users into folders—users will no longer be visible in the tree view under the root user directory. 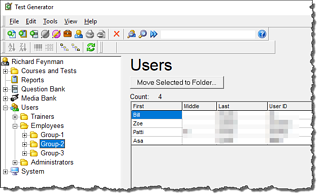 For example, members of the Test Takers user group will be organized into folders and the members of that group will be visible in a table, as in this example. Group-2 users display. Test authors can dbl-click on a row to display, review and edit a user profile.